A new flexible space is coming to BHS, thanks in part to two separate donations from BCEF. 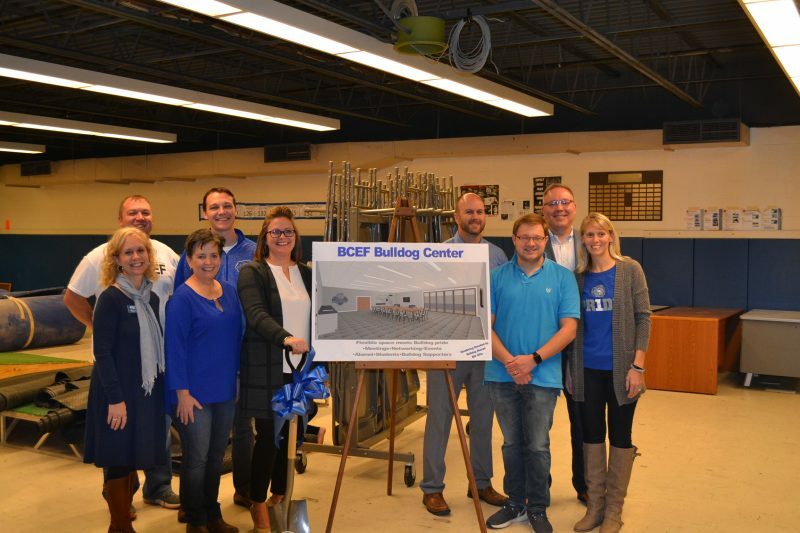 A funding partnership between BCEF and BCSC will convert the old BHS wrestling room into the BCEF Bulldog Center, a multi-purpose space for use by Batesville Bulldogs, from students to alumni to friends of the school corporation. This space is a continuation of our Flexible Learning Spaces initiative, giving the school corporation a flexible, multi-use space for all those with Bulldog pride. When completed, the room will feature meeting space, multimedia technology, and a new “skybox” area for viewing of activities in the main gym. This viewing area will be approximately three times the size of the current access door above the gym and is the first of its kind among schools in our area. BCEF hopes that this space will truly become a center for use by all Bulldogs. Possible uses include: alumni group gatherings (such as a gathering space at Homecoming and graduation for reunion years), school administration use for meetings, BCEF board meetings, student use for formal presentations, and as a venue to facilitate building relationships between Bulldog alumni and students for networking and career mentorship purposes. Funding comes from BCSC comes from contingency money from the BHS building project and an estate donation from Mary C. Horstman received several years ago. BCEF funds come from the board-created Andy Koors Legacy Fund and from the recent foundation raffle. The Andy Koors Legacy Fund was created by the BCEF board in 2017 after receiving a large unrestricted donation as the beneficiary of a life insurance policy held by the late Andy Koors. BHS German teacher. Part of that money has been earmarked by BCEF to continue sponsoring part of the program fees each summer of two BHS juniors who are chosen by the IU Honors Program in Foreign Language to study abroad. Our plans call for that program to continue. The amount for the Bulldog Center is being donated by BCEF from the Andy Koors Legacy Fund as a memorial to Andy’s service to the Bulldog community through his years of teaching, his care and concern for students, his photography of school events, his contributions to the athletic programs, and his dedication as a BHS alumnus. A plaque dedicated to him and all others who made this center possible will be hung in the Center when the room is formally dedicated. BCEF presents its plans for the old BHS wrestling room. Front row, L to R: Anne Wilson (Executive Director), Kim Kick (President), Jama Linkel-Cleghorn (Vice President), Brad Marcy, and Jenni Garrett (Secretary). Back row: Matt Moore, Alex Dudley, Eric Fledderman, and BCSC Superintendent Paul Ketcham. Not pictured: Lance Green, Eric Heppner, Bonnie Johnston (Treasurer), Cathy Martini, and Bill Narwold. The room renovations are scheduled to begin in November and will transition the current space from one large unfinished room into two spaces: a storage area for use by BHS and the new Bulldog Center. 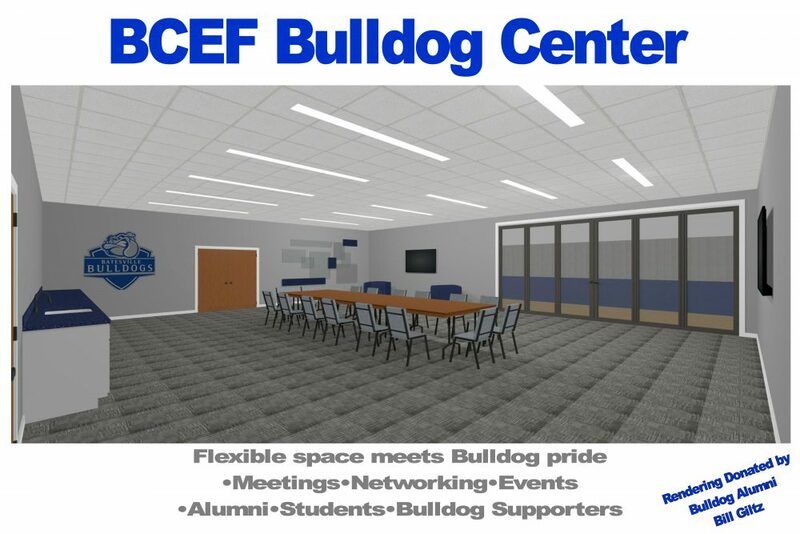 The BCEF Bulldog Center, which will be approximately 1925 square feet in size, will be accessible from the Commons, located inside the new Arts and Athletics entrance on the north side of the high school. Project completion is scheduled for the beginning of 2019, with a formal dedication ceremony coming sometime in second semester, perhaps before graduation with the 50th anniversary class in attendance. The Andy Koors Legacy Fund portion of BCEF’s donation will help fund the reconstruction of the Center itself. Funding for Center furnishings and technology will come from the proceeds of the BCEF raffle and other funds. Special thanks to BHS alumnus Bill Giltz for donating his time to produce a rendering of what the completed room may look like. Flexible space meets Bulldog Pride.